India was one of the first countries in Asia to recognise the effectiveness of the Export Processing Zone model in promoting exports, with Asia’s first EPZ set up in Kandla in 1965. This was followed by Santacruz electronics EPZ, Mumbai (1973) and Chennai EPZ (1984). The Special Economic Zones (SEZs) Policy was announced in April 2000. However, SEZs in India functioned from 1.11.2000 to 09.02.2006 under the provisions of the Foreign Trade Policy. To instil confidence in investors and to stabilise SEZ policy regime, the Special Economic Zones Act, 2005, was passed by Parliament in May, 2005 which received Presidential assent on the 23rd of June, 2005. After extensive consultations, the SEZ Act, 2005, supported by SEZ Rules, came into effect on 10th February, 2006. Rajasthan’s proximity to the Delhi International Airport and ports of the western coast, makes it an ideal location for export-oriented industrial development on a large scale. 40% of the Delhi-Mumbai freight corridor is passing through Rajasthan throwing up enormous possibilities for development of industrial belts such as special economic zones along the corridor. SEZs notified under SEZs Act 2005. (v) Development of Infrastructure facilities. SEZs help to provide employment to skilled, semi skilled and unskilled labour at large scale. SEZs contribute significantly to exports. Rajasthan came up with an SEZ policy and ACT in 2003 with major focus on Gems & Jewellery and handicrafts. Consequently, a SEZ was setup in Jaipur for Gems & Jewellery and one in Jodhpur for handicrafts. 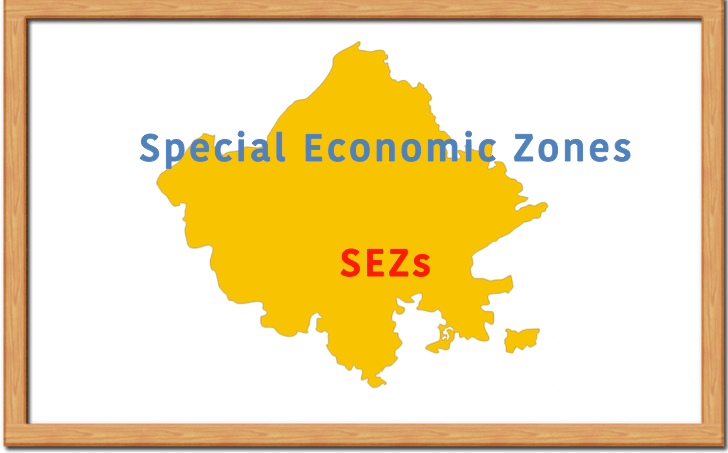 After 2005, the new SEZ’s came up under the Government of India Special Economic Zones Act 2005. In 2015, the Rajasthan Assembly passed the new Rajasthan SPECIAL ECONOMIC ZONES ACT, 2015 with to provide for the establishment, maintenance, management and administration of Special Economic Zones in the State. The Government of Rajasthan is promoting the development of several SEZs across the state for sectors such as gems and jewellery, handicrafts, IT, electronics, automotive/auto components and textiles. Land conversion @Rs.100/- to developers in rural areas. 100% exemption on stamp duty to developers and to units in RIICO SEZs. 50% exemption on electricity duty for seven years. 100% exemption from work contract tax to units and developers for seven years. 100% exemption from entry tax on capital goods brought into local areas by the unit required for use as capital goods for setting up industry in SEZs. 100% exemption from luxury tax for seven years. 50% exemption from entertainment tax for seven years.